First time traveler to Guadalajara Metro area and the Hotel was a nice surprise! Hotel is small and so are the rooms and features but they are very clean and comfortable. Would stay there again. The location of the Hotel Mendosa is GREAT! The Guadalajara Metro Area is very nice clean and lively. Be sure to go to Tepaque Parian - we patronize Betos. was very very good guacamole was salty but casuelas were gr8! Mariachi was awesome and I have heard many Mariachis. We attended the Chivas vs America Soccer Game at Akron Stadium and that was fantastic experience.Worth checking it out!! Thankyou for sharing your experience.with us. I'm glad you had a good time here. We will wait for you the next time you visit Guadalajara. This charming traditional Mexican hotel was a good choice for us. 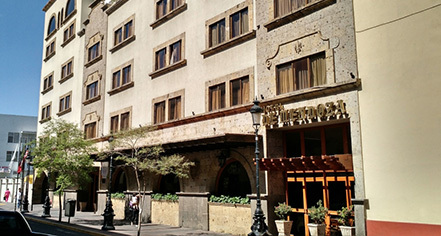 The location is fantastic, a block off the Main Centro square, it's quiet, walkable to many interesting attractions, beautiful architectural buildings, cathedrals, restaurants and markets. Staff is accommodating and friendly. We had a satisfactory Superior room on the second floor which although fairly plain, was spacious, very clean with good beds and pillows (very important for me with back/neck problems). I think there are better rooms around the pool but it was fine. On the last day, we discovered the roof top patio area. Beautiful with a 360 degree view of the city. I think they have a goldmine here if they would add a bar/snack or dinner reservation area. Watching sunsets with a refreshing drink in your hand from this location...stunning! As it is, the views are amazing but it's a large almost unused space. Maybe special events are held up there. One more thing...the main floor restaurant needs to add variety with some more ambitious and adventurous menu items. It wants pizazz. Everything they need is there, just an injection of energy, maybe some beautiful Mexican colour and mouth watering menu items. Very nice pool area with a Gym off the back. Beautiful old wood and glass in the lobby. Atmosphere! Really liked this place. Thankyou for sharing your experience with us. I'm glad you enjoyed your stay with us. We will wait for you the next time you visit Guadalajara. 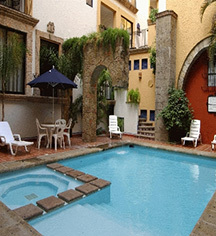 This quaint, clean and basic hotel is located steps from all the historical sites of old town Guadalajara. If you are used to 5-star hotels, this is not one of them, however it is a gem from a cleanliness, friendliness and location point of view. I stayed for 5 nights and took day trips via uber to Tlaquepaque and Tonala. I took 2 bus tours -- one a Tequila Tour and the other the Ajijic & Lake Chapala -- both well worth the $20USD cost. Lunch on your own. Most of tour in Spanish but you can figure it out. Very underrated place to travel in my opinion. I will go back soon! Thankyou for sharing your experience with us. I'm delighted you have a pleasant time with us. We will wait for you next time you visit Guadalajara. Regretting this deal, got charged more along the way. I just got here on Sunday for the second half of my honeymoon. When we called to book a honeymoon suite, we were quoted a good deal so we went ahead and booked it with our travel agent. She called me immediately saying that they were hiking the price of the suite. We then decided to go with a double bed room in Hope's to fix the misunderstanding of the room we actually wanted. When we arrived after a 10 hour drive, no one told us that the streets that access the hotel were going to be closed due to a festival. We're drove around for about an hour to find a way in. Once we had found a way to access the hotel, we're headed straight to the reception desk to our surprise they were giving us a double bed room but the beds were going to be "twins" not even fulls..! The receptionist said that they had a single queen size room for an additional 200 pesos ($10.50 USD) a night. We said fine because we were exhausted. They asked for the payment up front as if we were going to leave without paying. After paying for the extra charge to get a room closer to what we asked, the bellman escorted us to our room. He was a great help but efren we got the room, it left us more to desire based on the pictures and other reviews. It had a mildew and funny smell. We cracked the window open and it helped some. The next morning, I went to take a shower and the tub was plugged. I showered with my feet soaked in my own dirty water. As we left the hotel for the day, I made sure to report the smell, the tub and the fact they came to ask to change our sheets/ clean the room at 9am. That's when the receptionist told me that my valet parking was an additional 40 pesos per day ($2.10 USD), again this needs to get paid ahead of time. It was not a huge deal but then again they keep the costs hidden. So to make sure our car stayed safe, we're paid it. The last drop in the bucket was when we came back late in the evening and as we pulled our cat to the valet, the receptionist waded waiting for me and he was not allowing our car to be parked until an "urgent matter" was cleared. What was your "urgent matter" you ask? Well, we were not allowed to enter our room until we paid $500 pesos ($26.30 USD) because we were accused of a dirtying the mattress. We weren't allowed to see the mattress and talk with a hotel authority until we paid the charge. After much discussion with the receptionist in charge, nothing having access to our belongings and being super tired from a long day sightseeing, we obliged to pay. You would imagine that the story would end there, your wrong. After paying and reactivating our key cards, we're entered the room to a messy bed and we had to wait more than 30 minutes till they sent us fresh sheets and blankets. Let's just say that my wife was not a happy camper. We couldn't get ready for bed or even relax until the bed was done close to 12:10 am. We have one night left and I'll be talking to the general manager tomorrow about all this. I hope they don't make the rest of our stay horrible after leaving this immediate review as things happened, so it'll be fresh and honest. The pictures below are that of supposed "stains" we did. The last picture is of them leaving our window open and after all this ordeal coming into a room with mosquitos. The employees have been good for the most part but their management and approach to hidden cost are not worth it. We tried to save a little money, now we're regretting it. If things improve I'll keep ya'll posted. Thankyou for your comments, they are very important to improve our services. I apologize for the inconveniences you have had. We are taking care of it. I hope you can give us the opportunity to serve you again when you come back to Guadalajara. Upon further investigation, I discovered that the way to cancel reservations on the hotel's website: you must click "Book Now," which will open up the reservations page. On that reservations page, you must scroll all the way to the bottom and you will see, in very tiny blue print, a link that says "Cambios y Cancelaciones." Upon clicking that tiny text, you will be able to cancel your reservations with your confirmation number and last name. I do not think it is acceptable that staff working the Reservations Department is neither able to cancel reservations, nor familiar enough with the hotel's own online reservation system to give even rudimentary instructions to customers on how to do so themselves. I did call back to inform the young lady I had spoken to of how to do the cancellation on the website, so that she could hopefully direct future customers on how to do so. I hope that the obvious lack of appropriate training that the lady I spoke with has received is not the norm at Hotel de Mendoza, but it didn't leave me with a very positive impression of the hotel. Please give your staff the ability to cancel reservations and make sure they are familiar enough with your hotel's own website to be able to guide customers how to do so themselves. Also, some customer service training is warranted. If you don't have an answer to a customer's question, the most professional course of action is to let the customer know that you will try to find out for them and either put them on hold or take their information and offer to have someone call them back when an answer is found. Just flatly saying, "I don't know," is not something that a mature, competent professional does. I apologize for the inconveniences you had about it, your comments are very important to improve our services and we are taking care about it. I hope next time you visit Guadalajara you give us the opportunity and stay with us.